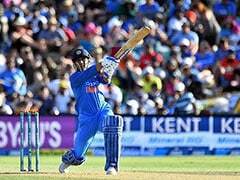 Highlights: India vs New Zealand 5th ODI: Ambati Rayudu was adjudged player of the match for scoring 90 runs. 15:20 IST: That brings an end to the 5-match ODI series in New Zealand. Thank you for joining us for the live coverage of the 5th ODI. 15:03 IST: OUT! Bhuvneshwar Kumar dismisses Trent Boult as India win by 35 runs and take the series 4-1. Boult top-edges towards third man where Mohammed Shami takes an easy catch. New Zealand have been dismissed for 217 runs. 15:02 IST: SIX! Henry hits another six over square leg. The slower bouncer was despatched for a towering six. 15:01 IST: SIX! Matt Henry hits the short ball for a huge six. 14:58 IST: OUT! Hardik Pandya strike. Mitchell Santner flicks it straight onto the hands of Mohammed Shami at short fine leg. New Zealand are 203/9 now. India need just a wicket to win. 14:57 IST: Leggie Yuzvendra Chahal finishes with 3/41 in 10 overs. New Zealand need another 49 runs from 43 balls. 14:55 IST: Chahal comes back to bowl his final over. 14:53 IST: FOUR! Matt Henry hits a boundary straight over Mohammed Shami's head. With this, New Zealand reach 201/8 in 42 overs. 14:50 IST: Matt Henry is the new man at the crease. He impressed with the ball today. Now it's time for him to do the needful with the bat. 14:47 IST: The decision stays as Todd Astle walks off. New Zealand lose their eighth wicket. They are 194/8 now as Chahal scalped his third wicket. 14:46 IST: OUT! Chahal dismisses Todd Astle LBW. But the Kiwi tailender has gone for the DRS. 14:44 IST: Yuzvendra Chahal is back to complete his quota of remaining overs. He has bowled an economical spell that has put the hosts in the back foot. 14:39 IST: Mohammed Shami is brought back into the attack. He has picked up nine wickets in the series so far and has been adjudged Player of the match twice. 14:37 IST: New Zealand need another 68 runs in 11 overs with three wickets in hand. 14:35 IST: FOUR! Todd Astle hits a lovely cover drive. New Zealand 184/7. 14:30 IST: Neesham's knock brought the required rate below 6. The Indian bowlers have started to put pressure back on the Kiwi tailenders again. 14:28 IST: Todd Astle is the new batsman at the crease. 14:26 IST: OUT! MS Dhoni is spot on as he runs out Jimmy Neesham. India strike a crucial blow to New Zealand's chances. It was Dhoni's presence of mind that got India the key wicket of Neesham. New Zealand 177/7. Latham's got to go. Went to sweep, but is pinned on the pads. 14:23 IST: SIX! The left-hander hits another six in the same region where he had hit the four. 14:22 IST: FOUR! Neesham hits Bhuvneshwar Kumar for a boundary over sweeper. Neesham is looking dangerous at 44 off 31. 14:19 IST: The home side needs 91 runs from 15 overs. This pair of Neesham and Santner have added 30 runs in as many balls. 14:15 IST: FOUR! Back-to-back four for the left-hander. 14:15 IST: FOUR! Jimmy Neesham hits Shami for a four. 14:09 IST: SIX! Jimmy Neesham has slogged Hardik Pandya's knuckle ball for that six. 14:07 IST: Wide! Pandya bowls a wide. 14:04 IST: The required rate is 6.59 as compared to the current rate of 4.27. The home side needs another 112 runs in 17 overs. 14:00 IST: That was well-fielded by Bhuvneshwar Kumar as he cuts down a certain boundary. Santner and Neesham take two runs. New Zealand 138/6 in 32 overs. 13:58 IST: Mitchell Santner is the new man at the crease. He joins James Neesham in the middle. 13:56 IST: OUT! Chahal strikes again for India. New Zealand lose their sixth wicket. Colin de Grandhomme has been dismissed for 11. Chahal has once again been impressive with bowling figures of 2/30 in 7 overs. 13:52 IST: New Zealand are 131/5 after 30 overs. They need another 122 runs to win in the remaining 20 overs. At this stage, India were 109/4. 13:51 IST: FOUR! Back-to-back boundaries for Colin de Grandhomme. Pressure back on India. 13:50 IST: FOUR! de Grandhomme hits Hardik Pandya for a boundary. 13:45 IST: Colin de Grandhomme is the new batsman at the crease. 13:43 IST: OUT! Tom Latham has been adjudged LBW by Yuzvendra Chahal. He is dismissed for 37 off 49 balls. At 119/5 New Zealand have lost half their side now. 13:42 IST: FOUR! Jimmy Neesham hits Kedar Jadhav for a four over deep mid-wicket. 13:39 IST: FOUR! Boundary to finish the over. That was beautifully hit by Tom Latham who rocked back to cut behind backward point to get those four runs. New Zealand reaches 111/4 in 27 overs. 13:34 IST: India have ticked three boxes right so far. Fielding and bowling have been top class for India. The asking rate has also gone above 6. 13:31 IST: WICKET! Kane Williamson has been dismissed by Kedar Jadhav, caught at long on by Shikhar Dhawan. A hard fought innings by the New Zealand captain came to an end as he was dismissed for 39 runs off 73 balls. 13:30 IST: We are halfway through the second innings. New Zealand are 104/3. India were 88/4 at this stage. 13:25 IST: Hundred comes up for New Zealand in the 24th over. 13:19 IST: Williamson and Latham have put on a 50-run partnership for the fourth wicket. The pair came together when the hosts were reeling at 38/3. 13:14 IST: New Zealand have reached 81/3 in 20 overs. At this stage, India were 57/4. 13:13 IST: Wide! Jadhav bowls a wide. New Zealand 80-3. 13:10 IST: Spin being implemented from both ends as Rohit Sharma brings in Kedar Jadhav from the other end. 13:08 IST: FOUR! That was bowled short by Chahal as Latham rocks back to hit the ball between sweeper and deep square leg. 13:07 IST: Change in bowling. Spin has been introduced as Yuzvendra Chahal has been brought into the attack. 13:05 IST: The pair of Williamson and Latham are playing cautiously as they have added 32 runs for the fourth wicket. New Zealand 70/3 in 18 overs. 13:03 IST: FOUR! That was a sweetly timed straight drive as Williamson hits back-to-back fours. 13:02 IST: FOUR! Williamson hits his second boundary over deep point. That was beautifully cut by the Kiwi captain. 13:01 IST: 17 overs have been bowled. New Zealand have scored 60/3. 12:57 IST: FOUR! Tom Latham hits a boundary. That was a good wristy shot as Latham balances the inswinging ball to get those four runs. 12:54 IST: Drinks break! New Zealand are 54/3 in 16 overs. 12:51 IST: 50 comes up for New Zealand in the 16th over. Following the dismissal of openers Colin Munro, Henry Nicholls, and Ross Taylor, the Williamson-Latham pair has quietly added 12 runs as the Indians have fielded excellently. 12:48 IST: FOUR! First boundary for Kane Williamson as he top-edged a bouncer from Hardik Pandya. 12:44 IST: Vijay Shankar is varying his pace nicely. He has given away just four runs in two overs. New Zealand 45/3 in 14 overs. 12:41 IST: That was very close to the stumps as Tom Latham nearly played it on. Hardik Pandya has given away just two runs in two overs that includes a maiden. 12:39 IST: Kane Williamson has now faced 29 balls and scored just six runs. 12:34 IST: Another change in bowling. Rohit Sharma brings Vijay Shankar into the attack. 12:33 IST: Wicket-keeper batsman, Tom Latham joins Williamson at the crease. 12:32 IST: Ross Taylor walked off after a chat with his captain without taking a review. However, the replay showed the ball clearly missing the stumps! 12:29 IST: OUT! LBW! Hardik Pandya strikes in his very first over. Ross Taylor has been dismissed cheaply. New Zealand 38/3. 12:24 IST: Ross Taylor joins Kane Williamson at the crease. 12:21 IST: BOWLED! Mohammed Shami strikes again. Colin Munro has been dismissed for 24 as Shami picks his second wicket. New Zealand 37/2. 12:20 IST: Nine overs have been bowled. New Zealand 37/1. 12:17 IST: FOUR! Munro hits another boundary towards the deep extra cover region. 12:15 IST: Just one run from the 8th over bowled by Mohammed Shami. New Zealand 30/1. 12:10 IST: MS Dhoni is changing the fielding positions slightly in the inner circle. In the absence of regular skipper Virat Kohli, he is lending his experience to stand-in-captain Rohit Sharma. 12:08 IST: FOUR! Munro hits another boundary to Bhuvneshwar Kumar. 12:06 IST: That was very close to the stumps as Williamson nearly chopped it on. Two runs were taken easily by Williamson and Munro. 12:05 IST: Three dot balls to start the over for Mohammed Shami. 12:02 IST: It was a decent over from Bhuvneshwar Kumar as only two runs came from the over. New Zealand 22/1 after 5 overs. 11:59 IST: End of 4 overs. New Zealand 20/1. 11:58 IST: Kiwi captain Kane Williamson comes into the crease. 11:55 IST: OUT! Mohammed Shami strikes. Henry Nicholls is dismissed for 8. A simple catch taken by Kedar Jadhav at mid-on. 11:53 IST: SIX! Colin Munro hits Bhuvneshwar Kumar for a big six over deep mid-wicket. New Zealand 18/0 in 3 overs. 11:49 IST: That was beautifully stopped by Vijay Shankar at the point. He dived to his left denying a certain boundary. Munro still snatches a single as chance for run out is missed by India. 11:48 IST: FOUR! Munro gently drives it for a boundary. That was sweetly timed. 11:45 IST: Mohammed Shami into the attack. 11:44 IST: End of the first over. New Zealand 3/0. 11:41 IST: Welcome back. It's time for the second innings to begin. The New Zealand openers have taken guard. Colin Munro will take strike. He is joined by Henry Nicholls. Bhuvneshwar Kumar will start the proceedings for India. 11:16 IST: India have been bowled out in succession in this series in the last two matches. Previously, they were bowled out twice in succession was against Bangladesh in Mirpur in 2015. 10:57 IST: New Zealand will be chasing 253 for victory. They will want to finish the series on a high note. A 22 ball 45 run cameo from @hardikpandya7 propels #TeamIndia to a total of 252 runs. Will the bowlers defend this total in the 5th and final ODI? 10:56 IST: RUN OUT! India have been bowled out for 252 runs in 49.5 overs. Shami wanted to take the strike as he marches from the runner end. But Trent Boult was quick to dislodge the bails. 10:54 IST: OUT! Bhuvneshwar Kumar is gone as Ross Taylor takes a blinder. India 252/9 with two balls to go. 10:54 IST: Mohammed Shami is the new batsman at the crease. 10:52 IST: OUT! Hardik Pandya is dismissed. He appealed for a no-ball concerning height. But nevertheless, he was dismissed courtesy a beautiful catch taken by Trent Boult. 10:50 IST: FOUR! That was beautifully tapped and the ball went away for a boundary in the third man region. 10:49 IST: OUT! Hardik Pandya is gone. Trent Boult objects as Pandya wants a review. In a hurry, he failed to reach the crease as it resulted in a short run. So just one run given to India. The umpire checks it and confirms it. 10:47 IST: Pandya and Bhuvneshwar take quick a double as Pandya wants to keep maximum strike with him. 10:46 IST: SIX! Pandya is taking the attack to the opposition. He has reached 40 off just 18 balls in no time. India 243/7 in 48.2 overs. 10:45 IST: FOUR! Pandya hits a superb cover drive for a boundary. 10:43 IST: SIX! Another brilliant six by Hardik Pandya as he slaps an incoming bouncer for a huge six between sweeper and deep mid-wicket region. 10:41 IST: Bhuvneshwar taps the ball and takes a single. Gives the strike back to Hardik Pandya. 10:40 IST: Dot ball to finish the 47th over. India 223/7. With Pandya looking dangerous, India now looking well on course to get past 250. 10:39 IST: SIX! Hardik Pandya hits third six in a row. That was hit for a massive six over the mid-wicket region. He is taking the attack to the opposition. 10:38 IST: Another SIX! Pandya has hit back to back sixes now. 10:38 IST: SIX! Hardik Pandya rocks back and hits Todd Astle for a six. 10:36 IST: Matt Henry completes an excellent spell. He dismissed four Indian batsmen today by giving away only 35 runs from 10 overs. 10:35 IST: Bhuvneshwar Kumar is the new man at the crease. 10:33 IST: OUT! Kedar Jadhav is bowled. Matt Henry strikes again. 10:31 IST: FOUR! Jadhav hits another four. India reach 202/6 in 45 overs. Jadhav batting on 34 and Pandya on 3. 10:30 IST: With six overs to go, Kedar Jadhav and Hardik Pandya will be looking to go all guns blazing and take India to a respectable total. 10:28 IST: No ball! FREE HIT. Hardik Pandya hits it hard. But misses it. Just a single. India 197/6. 10:27 IST: FOUR! Kedar Jadhav hits another boundary. 10:26 IST: Hardik Pandya is the new batsman at the crease. 10:24 IST: OUT! Rayudu is gone. Another chance to score a century goes missing. But he has earmarked his place in the middle-order going into the World Cup. A soft dismissal as Matt Henry is jubilated. New Zealand strike in the right time. 10:23 IST: FOUR! Rayudu hits another four. Into the 90s. 10:22 IST: End of 43 overs. India 186/5. Rayudu is well on course for a century batting on 86 ably supported by Jadhav on 25. 10:20 IST: Todd Astle comes to bowl the 43rd over. 10:19 IST: FOUR! Rayudu reverse-sweeps it for a boundary. 10:17 IST: FOUR! Rayudu rocks back and despatches the short ball towards deep square leg. 10:16 IST: Matt Henry is brought back into the attack by Kane Williamson. He is left with 3 overs. 10:14 IST: End of 41 overs. India reach 174/5. 10:12 IST: SIX! Second six of the over. Marvelous from Ambati Rayudu. He plays a similar shot with even more elegance and takes India to 168/5 in 40 overs. 10:10 IST: SIX! Beautiful shot. Ambati Rayudu slog sweeps into the leg side for maximum. 10:09 IST: In the air...But Kedar Jadhav is safe. He chips it over the extra cover to take a double. 10:06 IST: 150 up for India in 38.4 overs. Ambati Rayudu and Kedar Jadhav are solid on the crease with an unbeaten 34-run stand for the sixth-wicket. 10:03 IST: Ambati Rayudu dropped! Trent Boult is the culprit. He put it down at the long on. Rayudu takes a single to keep the strike and powers India to 146 foe five after 38 overs. 10:01 IST: FOUR! Shorter batsmen love to play the cut shot. Ambati Rayudu deflects the cross seam delivery by Colin Munro to third man for a boundary. 09:58 IST: FOUR! Crunched. That wasn't too short by Trent Boult but Kedar Jadhav takes full advantage of his height to pull it comfortably in front of square for a boundary. 09:55 IST: End of the over! Colin Munro just bowled his eighth over. India are 133/5 in 36 overs. 09:50 IST: FOUR! FIFTY! Ambati Rayudu scores his 10th ODI half-century off 86 balls. Again a pull shot aimed at backward square leg to get quick runs and take India to 129/5 in 35 overs. 09:49 IST: FOUR! Excellent shot. Ambati Rayudu advances and pulls it confidently to guide the shortish delivery down the boundary rope at backward square leg. 09:43 IST: End of the over! Kedar Jadhav takes a quick single to keep the strike and take INdia to 117/5 in 33 overs. 09:40 IST: Colin de Grandhomme comes back into the attack. 09:39 IST: Kedar Jadhav comes to the crease. 09:37 IST: WICKET! Miscommunication between Vijay Shankar and Ambati Rayudu cost India a wicket. Shankar departs for 45. This brings an end to the 98-run partnership. India are 116/5 in 31.5 overs. 09:29 IST: SIX! Ambati Rayudu lofts it up over the mid wicket for a huge six. It takes India to 109 for four and both the batsmen in forties. 09:27 IST: FOUR! 100 up for India in 29 overs. Vijay Shankar plays the late cutter to get quick runs for India. 09:21 IST: Mitchell Santner concedes four runs in the over. India are 93/4 in 27 overs. 09:15 IST: A bit of luck for Ambati Rayudu keeps him solid on the crease after the 25th over by Mitchell Santner. India are 88 for four with Rayudu and Vijay Shankar in charge. 09:12 IST: Mitchell Santner replaces Colin de Grandhomme. 09:08 IST: SIX! Ambati Rayudu follows it up with a huge six. He lofts it up gracefully to land the ball across the fence at long on. India reach 78/4 in 23 overs. 09:07 IST: FOUR! Ambati Rayudu flicks it away to the fine leg for four. 09:06 IST: Fifty runs partnership comes up between Ambati Rayudu and Vijay Shankar. 09:05 IST: End of the over! Just two runs from the over. 09:02 IST: Colin Munro replaces James Neesham. 08:58 IST: FOUR! Easy runs for India. A short pitch delivery by Colin de Grandhomme hits Vijay Shankar hard on his helmet and slides down to the boundary rope. 08:55 IST: FOUR! Confident shot. Ambati Rayudu pulls the shortish delivery by James Neesham to deep mid wicket for a boundary. It takes India to 55 for four in 19.3 overs. 08:51 IST: 50 up for India! Ambati Rayudu drives the ball to long on and takes a double to take the team past fifty-run mark. 08:49 IST: FOUR! Cross seamer from James Neesham. Vijay Shankar uses the angle of the delivery, flicks it away to the leg side for a boundary. 08:45 IST: End of the over by Colin de Grandhomme! Just three runs off it. India are 43/4 in 17 overs. 08:40 IST: Time for drinks! Trent Boult and Matt Henry helped New Zealand take early control and repeat the dominance that they displayed in the fourth ODI in Hamilton. 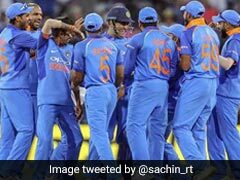 Both Boult and Henry claimed two wickets each before Ambati Rayudu and Vijay Shankar stabilised India after early blows. 08:36 IST: Colin de Grandhomme concedes just two runs. India are 39/4 in 15 overs. 08:33 IST: Colin de Grandhomme comes into the attack. 08:32 IST: End of the over! Nine runs from the over. India are 37/4 in 14 overs. 08:29 IST: FOUR! Leg byes. James Neesham starts with a fullish delivery down the leg side, gifts some bonus runs to India. 08:28 IST: James Neesham comes into the attack. 08:22 IST: FOUR! Byes. Bonus runs for India. The visitors move to 26/4 in 11.3 overs. 08:19 IST: Matt Henry bowls a maiden over. India are 22/4 in 11 overs. 08:16 IST: FOUR! Beautifully timed through the mid wicket for a boundary. Vijay Shankar gets off to the mark in style. 08:14 IST: Vijay Shankar comes to the crease. 08:13 IST: WICKET! Beautiful delivery by Trent Boult. He castles MS Dhoni for one to claim his second wicket. India are 18/4 in 9.3 overs. 08:08 IST: MS Dhoni is safe! New Zealand lose their review. The HawkEye shows the ball was missing leg stump. 08:06 IST: Review time! MS Dhoni is the man in question. 08:04 IST: End of the over! Trent Boult follows it up with a maiden over. India are 17/3 in eight overs. 08:02 IST: MS Dhoni comes to bat at number five. 08:00 IST: WICKET! Lovely catch from Mitchell Santner. Young man Shubman Gill departs for seven. Matt Henry claims his second wickets. India are in deep trouble, 17 for three in seven overs. 07:57 IST: FOUR! Stylish shot. Shubman Gill plays a glorious straight drive to get quick runs for India. 07:56 IST: Ambati Rayudu comes to the crease. 07:54 IST: WICKET! Trent Boult claims his first wicket, removes Shikhar Dhawan for six. New Zealand send India's opening pair back to the pavilion. Boult dismissed Dhawan for fourth time in the five-match series. 07:50 IST: Shubman Gill successfully survives the fifth over by Matt Henry. India are 10 for one with Shikhar Dhawan at the other end. 07:48 IST: Shubman Gill comes to the crease. He made his debut in the fourth ODI in Hamilton. 07:46 IST: WICKET! India lose their skipper. Rohit Sharma departs for 2. Matt Henry strikes early for New Zealand, leave India at 8/1 in 4.1 overs. He lost his wicket for seven runs in the fourth ODI and India were wrapped up for 92. 07:42 IST: FOUR! A little deflection from Shikhar Dhawan helps the ball roll down to fine leg for four. India get their first boundary, reach eight without loss after 3.2 overs. 07:38 IST: End of the over! Trent Boult starts with a maiden over. India are one without loss after two overs. 07:36 IST: A huge appeal for LBW against Rohit Sharma falls on deaf ears. 07:30 IST: Rohit Sharma and Shikhar Dhawan are out in the middle to start India's proceedings. Matt Henry to open the attack for New Zealand. 07:25 IST: "We were looking to have a bowl first, to take a bit out from the surface if possible. Obviously, it's a good surface prepared for two games," Kane Williamson says at the toss. 07:20 IST: "Seems a good pitch, might have some moisture but we want to test ourselves in such situations. After the humiliating looss the other day, we want to put up a bigger show," Rohit Sharma says after winning the toss. 07:02 IST: TOSS! 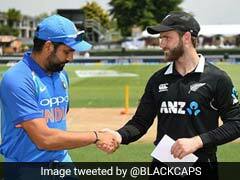 India win toss, opt to bat against New Zealand. MS Dhoni is back, he comes in the place of Dinesh Karthik. Mohammed Shami and Vijay Shankar replace Khaleel Ahmed and Kuldeep Yadav respectively for the final ODI. For New Zealand, Colin Munro comes in the place of injured Martin Guptill. 06:55 IST: Either Shubman Gill or Dinesh Karthik will have to sit out if MS Dhoni returns to the team. The 19-year-old Gill made nine runs on his debut, while Karthik was dismissed for zero in the third ODI in Hamilton. 06:50 IST: Wicketkeeper-batsman MS Dhoni, who missed last two ODIs, is expected to play the fifth ODI against New Zealand. Assistant coach Sanjay Bangar, at the pre-match conference, confirmed that Dhoni is fit and available for the game. 06:40 IST: Hello and welcome to out live coverage of the fifth and final Test of the five-match ODI series between India and New Zealand in Wellington. Assistant coach Sanjay Bangar confirmed that Dhoni is fit and available for the game. Dhoni's calmness in anchoring the innings will be priceless and young Shubman Gill might make the way in the playing XI as the World Cup preparations hit full swing. The Hamilton match was an eye opener where Ambati Rayudu, Kedar Jadhav and Dinesh Karthik failed to prove a point that they can stand up and be counted if Rohit Sharma and Shikhar Dhawan fail on a given day with Kohli also not around. 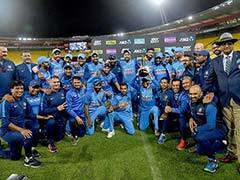 With the three-match T20I series ahead and also the World Cup round the corner, India will have to address this weakness to ensure that their much-vaunted batting doesn't crumble on an odd day when the condition aids swing bowling in England. Rohit has already described it as ''one of the worst batting performances" by the team and he would like to lead by example by quickly getting over the disappointment with another fiery opening stand with Shikhar Dhawan on Sunday. 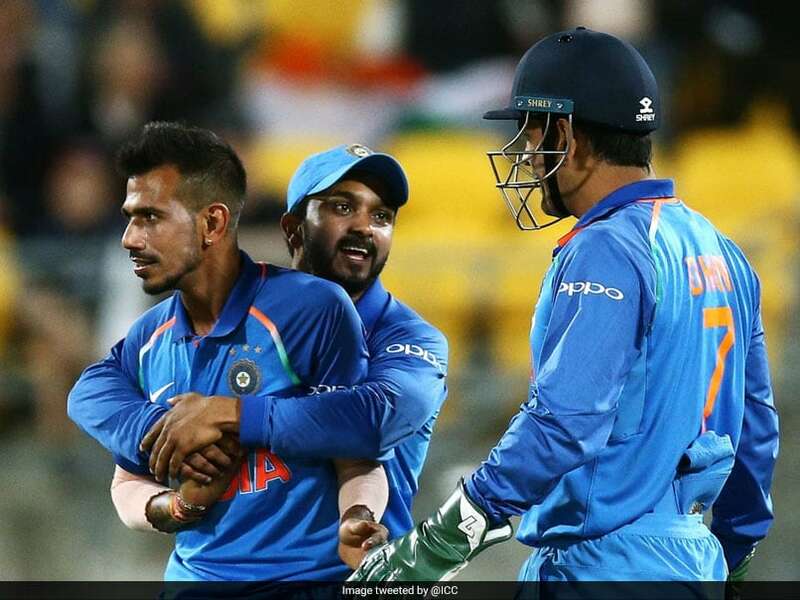 Having returned from provisional suspension post his loose talk on a TV chat show, Hardik Pandya gave ample display of his importance in the ODI team and he will look to continue to deliver.